Charades is a very popular game and you can play this game as groups or individually. 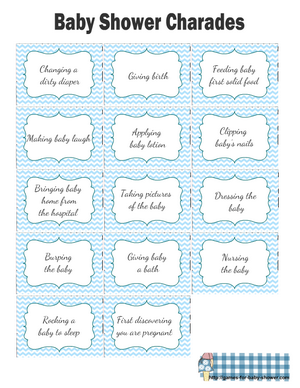 I have prepared some adorable Free printable Baby Shower Charades Game cards in three different colors. There are many baby and pregnancy related clues given on each card. You can print these cards using any printer. You need to cut each card around the edges and you can put the cards in a jar or a basket. You can also use these charades clue cards to play pictionary game. How to Play: At the baby shower party divide your guests into two teams. A player from each team will take a card and demonstrate the phrase written on that card to their team without saying a word. For each correct guess the team will get one point. The team with more points will be the winner. There are so many different rules to play charades so you can set your own rules too. Here is the first set of these free printable charades cards. This cute set is decorated with a green chevron pattern. There are many baby and pregnancy related clues given on each card. There are 14 cards in this printable. To save or print these cards just click on this thumbnail image and you will get the bigger printable version of this game. Here is another set of these charade cards and it is in an adorable baby blue color. You can print these clue cards for your boy baby shower. Just click on this thumbnail image and save or print the bigger image. 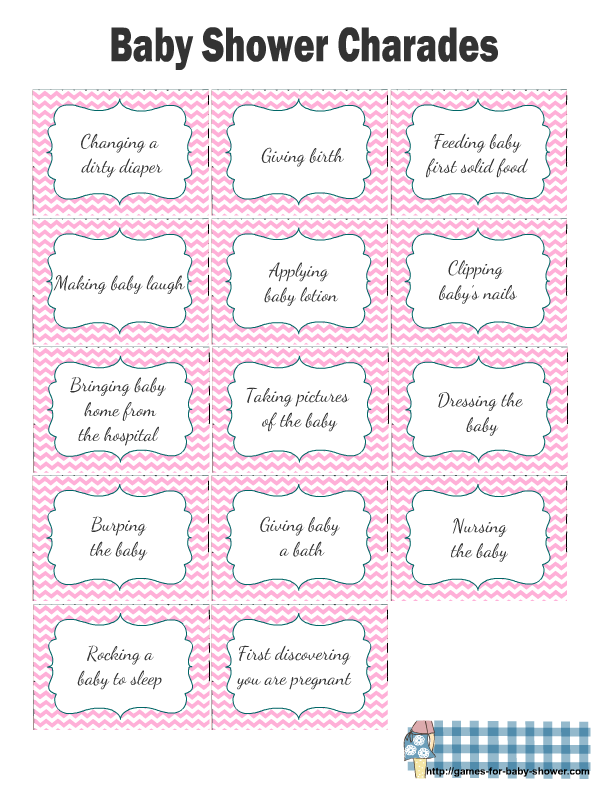 This is the last set of these free printable baby shower charades cards and this set is decorated with a pink chevron pattern. You girl baby shower party guests would love to play this fun game of charades with the help of these adorable cards.